POKÉMON has cultural longevity y’all. What began with three video games in 1996 has become an enduring pop culture phenomenon. There are seven generations of main game titles and over a dozen spinoff games. Pikachu, the series mascot, is as recognizable as Spider-Man and Superman, if not more so. POKÉMON anime has run continuously since 1997, both on television and in a long series of movies. On November 24th, the animated feature POKÉMON THE MOVIE: THE POWER OF US hits the US in limited release. 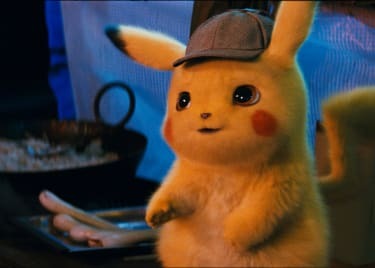 And POKÉMON: DETECTIVE PIKACHU, the first live-action film in the franchise, is coming in 2019, with Ryan Reynolds voicing Pikachu. 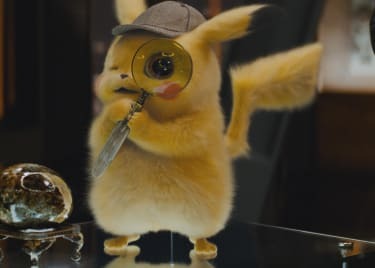 Both THE POWER OF US and DETECTIVE PIKACHU promise all manner of in-jokes, Easter eggs, and homages. Let’s take a look at a few that have been shown off in their trailers. THE POWER OF US is the second animated POKÉMON movie in a series that tells new tales featuring Ash Ketchum and Pikachu. These are separate from the long-running TV continuity, which makes THE POWER OF US a great entry point for new fans. The movie follows five characters who unite at a wind festival in Fura City. The event is meant to be capped by the appearance of the legendary Pokémon Lugia. Ash and Pikachu are also at the festival, and when they meet the other five, things start to happen. The biggest POWER OF US easter egg is the film’s setting and story. It references two of the earliest movies in the franchise: POKÉMON: THE MOVIE 2000, and POKÉMON HEROES. Ash and Pikachu visit a region with deep ties to the mighty legendary Pokémon Lugia, and that region is built around a major element – HEROES was set in a canal-laden city inspired by Venice, and THE POWER OF US takes place in a city dominated by windmills. Ash is seen attempting to wrangle and ride a powerful Pokémon called Tyranitar. One of the longest standing pieces of lore in the series involves humans and Pokémon living and working together in situations both mundane and extraordinary. POKÉMON RUBY and SAPPHIRE for instance, featured your player character moving to a new home with the help of body-building Pokémon Machoke. Three of the series’ spinoff games are basically ways to hang out with a Pikachu. One of those is DETECTIVE PIKACHU for the Nintendo 3DS, and the game serves as inspiration for the film of the same name. Ryan Reynolds provides the voice of the mystery-solving electric mouse. Justice Smith plays his human partner. This movie is a big deal in the world of POKÉMON. It’s a full-fledged summer blockbuster with a genuine movie star performing its fluffy hero in a deerstalker hat. One of the most visible easter eggs is Jigglypuff. Her microphone and intense irritation at people falling asleep when she sings suggest that she’s the same Jigglypuff who followed Ash and friends during the first few years of the anime. 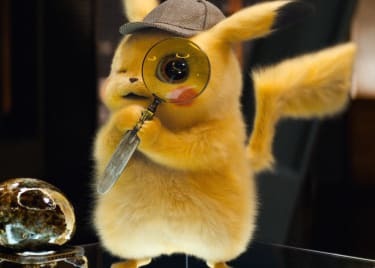 When Detective Pikachu demonstrates to Tim that most people can’t understand him, we see nearby people hearing only “Pika Pika!” While Ryan Reynolds provides Detective Pikachu’s voice, in that moment we hear the voice of Ikue Otani. She’s Pikachu’s long-time voice actress — if you’ve ever heard Pikachu in other media, chances are you’ve heard Otani. 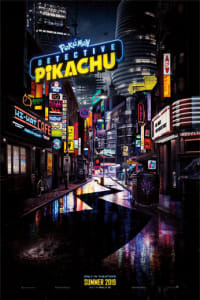 There are posters all over Ryme City, where DETECTIVE PIKACHU takes place, and in Tim’s room. One in particular announces a fighting tournament featuring the brawling pig monkey Pokémon Primeape. Early in the anime, Ash and his Primeape participated in just such a tournament. Finally, for an impressively obscure nod, watch the food stalls in the market where Tim and Detective Pikachu talk about how only Tim can understand him. There’s a plate of leeks styled exactly like the one carried by wild duck Pokémon Farfetch’d, who’s famous for brandishing a leek like a sword. POKÉMON THE MOVIE: THE POWER OF US opens on November 24.